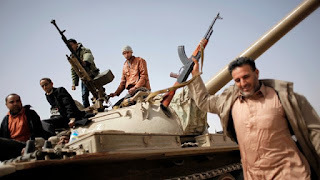 Aljazeera has just reported that clashes have erupted in the Libyan city of Zawiya. "We are fighting with the pro-Gaddafi followers. Gaddafi followers still exist and we're still tracking them down and capturing them. We will clean the country of them." Mohamed Sayeh, a member of Libya's interim government, the National Transitional Council (NTC), played down the fighting. He told the Reuters news agency it was an attack of men from Zawiya who wanted control of the Imaya military base, and who had been misled by a rumour that Gaddafi loyalists were in the area. The incoming prime minister, Abdurrahim El-Keib, has promised to disarm the country and set up a national army, but has yet to announce a concrete timetable or form a government. The statement - We will clean the country of them - is ominous at a minimum. I wonder if this portends a future civil strife in Libya. The armed men in Libya are not going to disarm willingly, and they do appear bent on ridding the country of opponents (or any perceived opponents). This does not bode well at all for Libya.